Rockne Dilosa received Christ as his Lord and Savior, in August of 1974. He married his lovely wife, Melvina in February of 1975. He was the drummer and percussionist in the choir and also tried to sing a little. 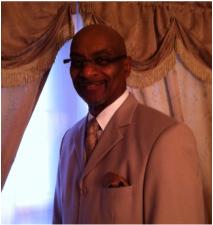 God elevated him to a deacon by appointment of Elder Rufus J. Nelson, in 1976. He worked as a Sunday School Assistant Superintendent and years later was promoted to Superintendent. In that same year, he was called by God to be a Minister of the Gospel. Since that time, he has been Pastor of one of the greatest congregations in the world. Revelation chapter 4 speaks about the greatness, power, and majesty around the throne of our God. At His feet there is power and glory, healing and blessings forevermore. Hebrews 4:16 tells us to come with an attitude of boldness; the throne of God is a place of authority and praise. It is a place to obtain God’s grace when it is needed. Hebrews 10:19-23 exhorts us to come boldly and come in faith not wavering, “holy faith”. Hebrews 10:38 states that we must live by faith. Believe that our God can do anything; and I can do all things through His strength, Philippians 4:13. The word of God tells us faith can only work when it is driven by love. Galatians 5:6, love must be our driving force. 1John 4:16-19 tells us that we must know and believe in the love that God has for us. His perfect love for us will cast out all our fears. Oh, people of God, lets continue to praise and worship our God with all that is within us no matter the trial or tribulation. He is worthy of our praise. We have a kingdom that cannot be moved, for our God is a consuming fire, Hebrews 12:28-29. Blessed people of God stay around the throne. Stay at His feet and you will run and not faint. Hallelujah! One of the devils most deceptive kinds of bait is something every Christian has encountered – offense. If we pick it up and consume it and feed on it in our hearts, then we have become offended. Offended people produce much fruit, such as hurt, anger, outrage, jealousy, resentment, strife, bitterness hatred, and envy. Some of the consequences of picking up an offense are insults, attacks, wounding, division, separation, broken relationships, betrayal, and backsliding. Often those who are offended do not even realize they are trapped. They are oblivious to their condition because they are so focused on the wrong that was done to them, they are in denial. The most effective way for the enemy to blind us is to cause us to focus on ourselves. Jesus said it is impossible to live this life and not have opportunity to be offended. (Luke 17:1) Most of the time that people are not set free from this trap of offense is because of pride. It holds people back from being honest with themselves and others. When we allow God to release us from this trap, we can reach higher levels of anointing and receive answers to prayers. The release you may have been seeking for years can come in a moment once you are free. The greatest thing we can use to combat the trap of offense is genuine love. The love that only comes from God. (1 John 4:7-8) Everyone that loveth is born of God and knoweth God. In the new birth, old mindsets, ways, and means of operation should be passed away and behold all things are new in our life. (2 Corinthians 5:17). This is one of the basic keys to our lives as born again believers. Get “I” out of way and let it (love) manifest itself in our lives. People of God, we have a lot of work to do in the area of perfecting love in ourselves according to the will of God, but please understand this is not hard. We have plenty of help from the Holy Spirit (John 16:13). We are commended by our Lord and Savior, I said our Lord and Savior, to love one another (John 13:34-35; 14-15) If ye love me, keep my commandments (John 15:12; 15:17; 2John 4:7; 1John 4:16; 5:3). Galatians 5:14, for all the law is fulfilled in one word even in this thou shalt love thy neighbor as thyself.